“Secretly obsessed with the idea of perfect pants,” Maron goes home and gets in the tub with the jeans on, but then decides he’s been had, comparing himself to a clown being dunked at a carnival. I tried the Levi’s website’s approach and soaked the jeans and wore them around on a sunny day. There is a certain childish thrill to soaking something in the bathtub when it’s not supposed to go there, and I even giggled out loud by myself at one point in the process. 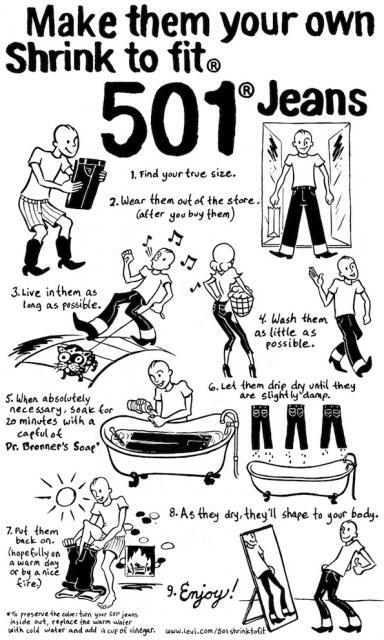 I used cold water because I didn’t mind losing some of the color in the jeans, and putting on the cold, heavy, wet jeans was unspeakably uncomfortable at first. Later the effect of the cold and the Dr. Bronner’s helped take the edge off the hot day. But mostly it’s just super irritating. 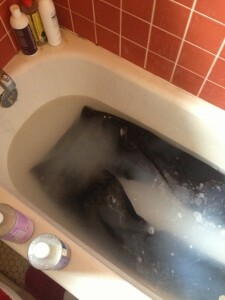 My jeans in the tub. The jeans did not end up fitting perfectly. They started out fitting poorly, and now they fit a little better. I was only in it for the sake of having jeans that magically fit perfectly, but they just went from bad to decent. The Shrink-to-Fits are absurd because, like much of contemporary men’s fashion, they conflate foppishness with ruggedness. The idea of walking around in public in sopping wet jeans, hoping no one on the bus can tell, like someone with an obscure sexual fetish, is connected to the life of a carefree 1950s-style cartoon rocker whose girlfriend does his laundry for him, just as handlebar mustaches and the kind of clothes you buy at a saddlery are now associated with going to brunch and playing in experimental noise bands. Look, I’m not blowing anybody’s mind saying hipsters are vain or that fashion can be silly. But take a look at this semi-recent Levi’s commercial, which quotes Walt Whitman. It’s invoking something that I think young people today feel a legitimate existential yearning for: a type of freedom, but also a type of duty and importance. Something beyond bartending and Snapchatting and watching “Breaking Bad”. There are, of course, still ways to attain the kind of experience Whitman is talking about in his famous poem, which I believe is titled “Levi’s Jeans are Cool”-- joining the Peace Corps or Teach for America, for instance, or moving to New York or L.A. for that last ditch effort towards becoming a screenwriter/hand model. The thing is, you can do those things in whatever pants you want. If that commercial speaks to you, it is not because you need to make some weird, soggy historical reenactment of your day’s errand-running. Levi’s 501 Shrink-to-Fit Jeans are $39.90 on their website—down from $74.